1. Sepia studio portrait on mounted on brown card with black trim. Fanny Mary Shea (on left) & Dorothy Agnes Shea (on right). Inscribed on back with "To Aunt Kate & Uncle Jim, from Fan & Doss". 2. Postcard portrait of Dorothy Agnes Shea. Inscribed on back: "To Aunt Kate with love from Dorothy". 3. 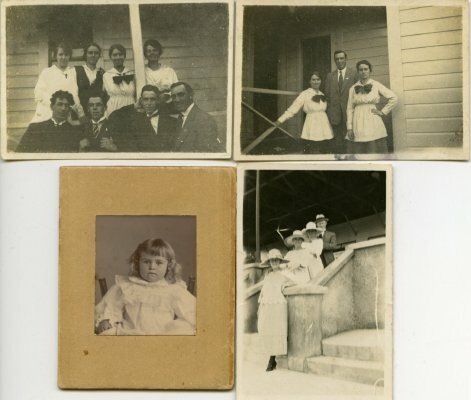 Small photograph of Dorothy Agnes Shea as a toddler. 4. Group photograph, 4 young women and 4 young men. Dorothy is second from left. 5. Two young women with young man, standing on porch step. One of the women is Dorothy Shea. 6. 3 young ladies and a young man standing on the steps of the Grand Stand at the Race Course. 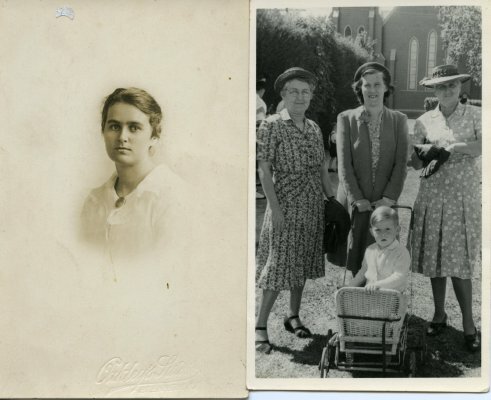 Left to right: Fanny Shea, Dorothy (Doss) Shea; Reen Jones (nee Atkinson); Perce Jones. 7. 3 women with young boy in buggy, outside a Church. Left to right: Fanny Shea; Kathleen Lucas; Wayne Lucas; Dorothy.